Reacting to the rain contrasts the Centro Botín with the other cultural building authored by a Pritzker winner just 102 km along the coast to the east: Frank Gehry’s Guggenheim Bilbao, the instant icon that opened 20 years ago. 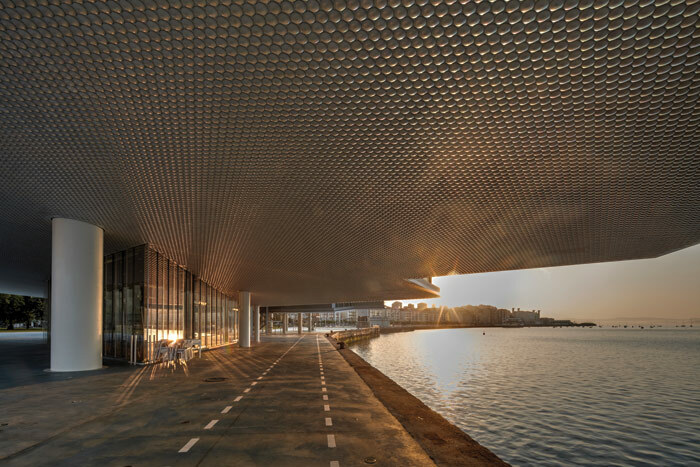 Its shiny, cleaving, titanium surfaces summon the sun to glint its dazzling rays across the Basque city. The buildings’ relationships with their cities are different, too. The Guggenheim kick-started the revival of a post-industrial town, and put it on the map. 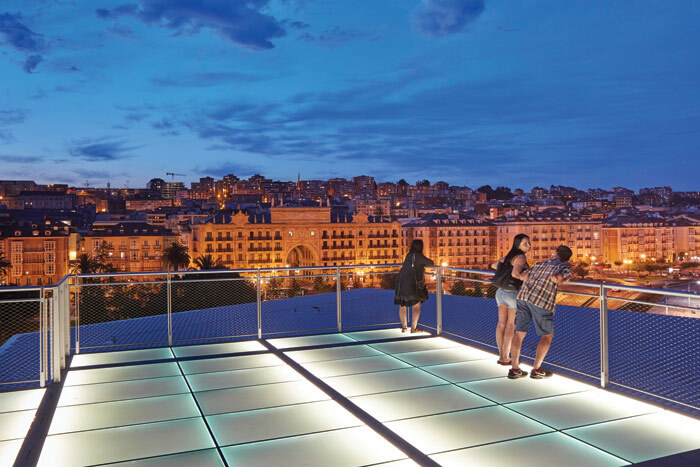 While the Centro Botín project is also an exercise in urban regeneration, it is less about chasing the ‘Bilbao Effect’ — unlike the Basque city, Santander had not been ravaged by decline. Once a fishing port and royal summer residence, it’s a confident place with an established tourist trade, and it still hosts the headquarters of the bank named after it, with reported assets in 2015 of $1.3trillion. Emilio Botín was president of the Grupo Santander when he met Piano in 2010. Piano recalls he ‘was a fisherman. I am a sailor. He was a man in love with his city’. A year later, Piano was commissioned to design a cultural building in Santander for the Fundación Botín, a private foundation that supports creative and biomedical initiatives as well as local social projects in Cantabria. The site was a car park by the Jardines de Pereda, a small historic park at the western end of the Paseo, a corniche boulevard over which grand buildings look across the water. They include the Banco de Santander’s neoclassical 1923 base by architect Javier González Riancho, from which a huge Spanish flag flies. 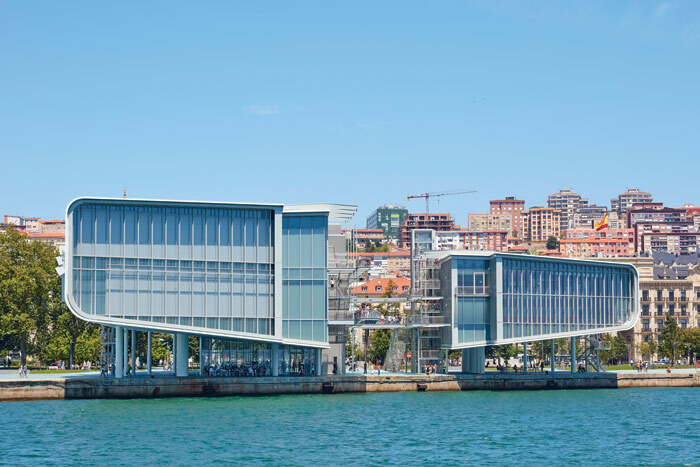 Botín had initially wanted the Santander centre ready by 2015, but died in 2014, at which point his son Javier Botín became the foundation’s chair. Piano knew the job would take longer, and his practice RPBW teamed up with one of Spain’s largest architecture studios, Luis Vidal + Architects, designer of the crisply user-friendly Heathrow Terminal 2 (2014), which since 2010 has also been working elsewhere on airport projects with RSHP. That closes a loop back to Piano’s old friend Richard Rogers and the time when, as he says, ‘I was a bad boy’. Together they had designed ‘a heretical thing’, perhaps the biggest turning point in architecture since modernism — the Centre Pompidou, Paris (1977). 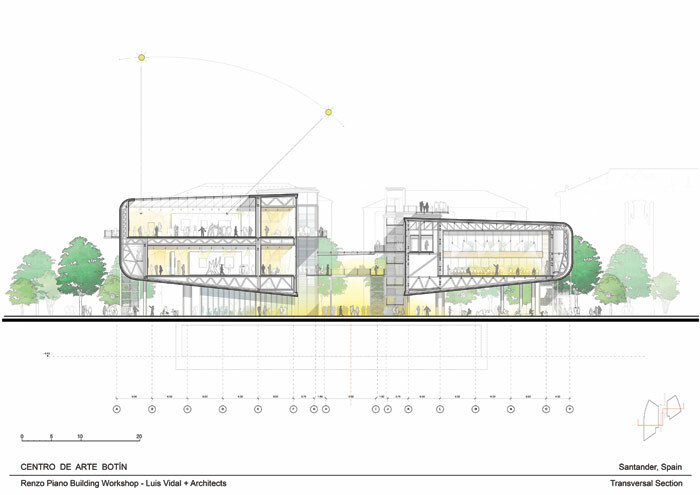 Its central ideas, as we shall see, return to inform the Centro Botín. 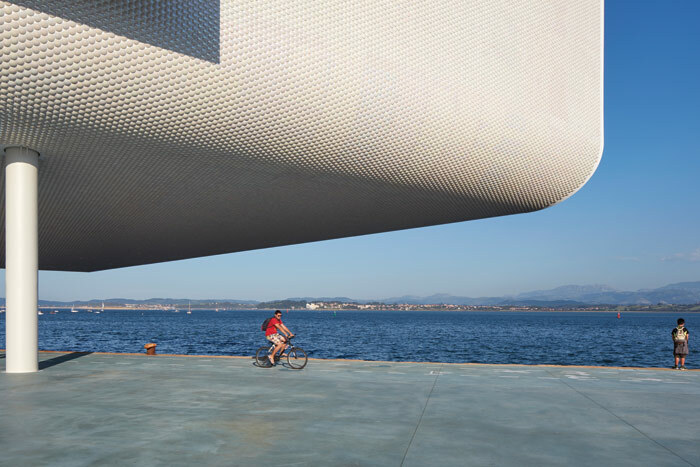 If the Guggenheim can be considered as like a fortress formed of fantastic flows from within the earth, the Centro Botín by contrast has just made a soft touch-down like a lunar module on the moon. The mass is held clear from the ground. Like Apollo 11, it even spent time hovering before landing, ‘moving up and down for a while’ as Piano says. ‘At the beginning, we wanted to put our feet in the water,’ and half of the building was to be over the bay. The original plan also had a footbridge extending from the gap between the two volumes over the Paseo. The Centro Botín finally settled just beside the water, in a position where the gap between its two parts aligned exactly with that of the 1840s’ market Mercado del Este, a block inland from the Paseo. The raised volumes are held aloft on cylindrical columns. Piano explains: ‘If you put it on the ground, you block the view of the bay, the connection between the city and the sea.’ In plan, they are like a pair of lungs, but one just half as big as the other. Each volume resembles a flat pebble that could be skipped across water. They have a retro-futuristic aesthetic, reminiscent of Future Systems’ Lord’s Media Centre (1999) in their curving-edged solid forms cut by glass planes, but deeper and wider. 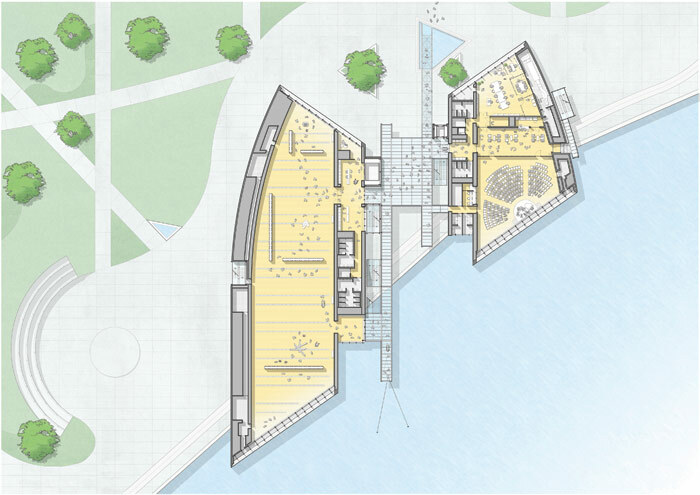 The larger western wing is like a mothership, housing 2,500 sq m of gallery space on two levels, with a vast, double-glazed facade facing south across the water and aligned with the dock edge. Through it, sunlight can shine into the galleries. ‘In winter, the sun is low, you have to bring down the blinds — but only 20% [of the time],’ says Piano. A skylight covering about half of the roof is the primary illumination of the upper gallery. The north facade — another wall of glass — is angled such that it directly faces the Twenties’ Santander Bank headquarters beyond the park. The solid western facade, the widest stretching around 100m, is cut by a huge vertical bay containing exterior stairs, and traversed by a gangplank mounted at level 2 — a hint of the circulation infrastructure elsewhere. A large LED screen is mounted to face a new amphitheatre set in the park below. On the other side of this great western volume, the smaller eastern wing floats parallel to it, like a cetacean calf beside its mother. 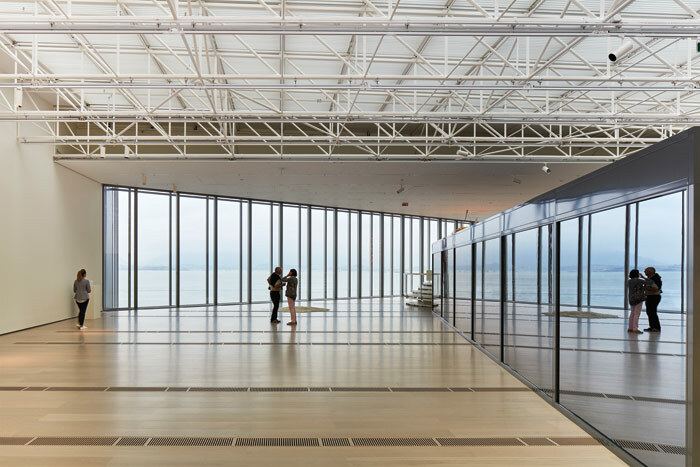 It contains a 330-capacity auditorium with a double height 7.5m ceiling, also looking across the water through a great glazed facade parallel to the western one. There are offices on its northern side and, crucial to the original brief, educational facilities. As in the other volume, the north facade is angled into the gap, so they both extend out from it like ears. An accessible terrace is mounted above the roof, below the roof level of the western volume, but commanding clear views in all other directions. From here, the town can be seen rising steeply behind the sweep of the Paseo, which recedes east to the distant über-PoMo mass of the Palacio de Festivales (1990) by Francisco Javier Sáenz de Oiza. It is the Centro Botín’s solid surface where Piano has responded directly to Santander’s damp weather. 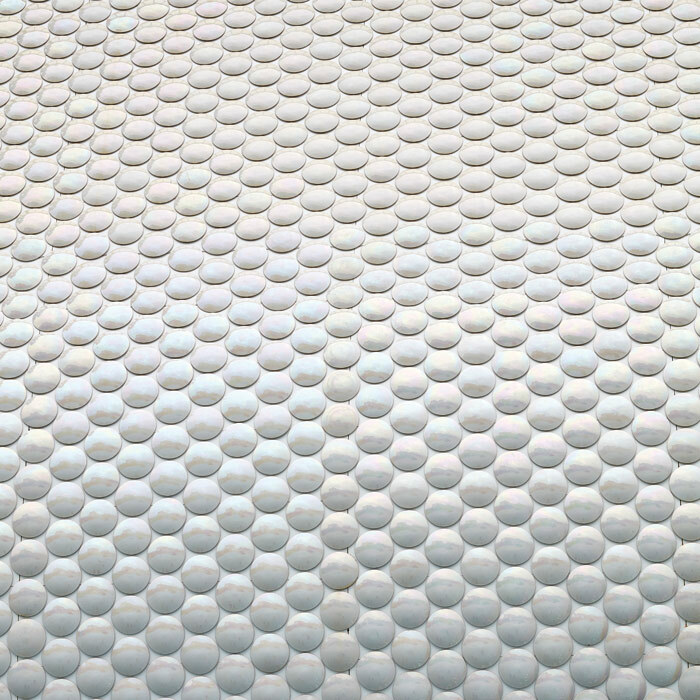 It is completely covered by 280,000 convex ceramic disks (‘like pixels’ says Piano), supplied by Ceràmica Cumella of Barcelona, which also supplied the difficult tiles for MAAT in Lisbon. This surface is continuous on each volume, from the roof, around the outer-facing sides, to the underbelly. There are precedents for exterior curving fields of disks — the envelope of Future System’s Selfridges Birmingham (2003) and the roof of Herzog & de Meuron’s Elbphilharmonie, but they are aluminium and flat perforated plates respectively. Recessed unobtrusively beneath the western volume is a fully glazed ground-level enclosure with a shop, information desk and restaurant called El Muelle, where celebrity chef Jesús Sánchez cooks up Cantabrian cuisine. But what about that spatial disconnect between the two volumes? Never mind the gap, it is here that they are unified, and the entire composition is animated. 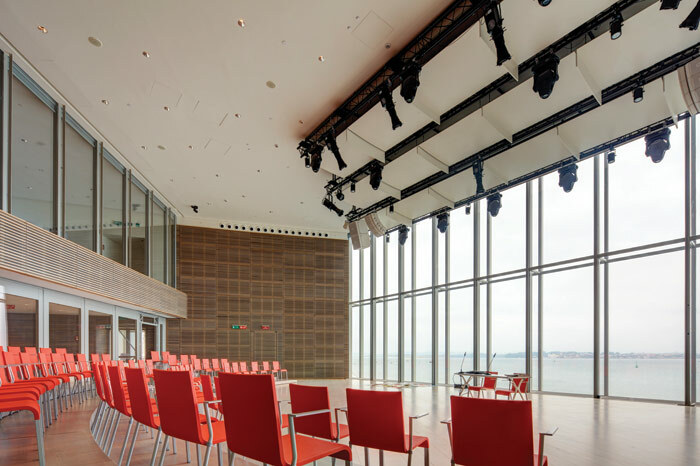 At level 1, a wide platform of frosted glass set in a steel grid spans the space between the east and west wings, creating an open landing that connects with entrances, exterior stairs and lift shafts adjoining the blocks. Above it, clear glass on the same grid pattern provides partial cover at level 2. Stairs climb all the way to the eastern roof terrace. Most exciting, gangways of translucent glass extend from the level 1 landing beside each volume, with further gangways above them. Illuminated from within the steel grid at night, they become planes of light in space. 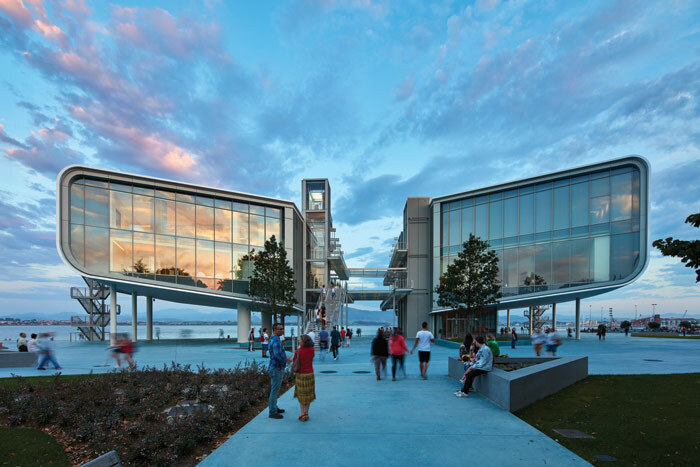 By day, they have something of the excitement of Diller Scofidio + Renfro’s elevated paths in the Blur pavilion on Lake Neuchatel for the Swiss Expo 2002, but instead of a thick mist, these lead into space. 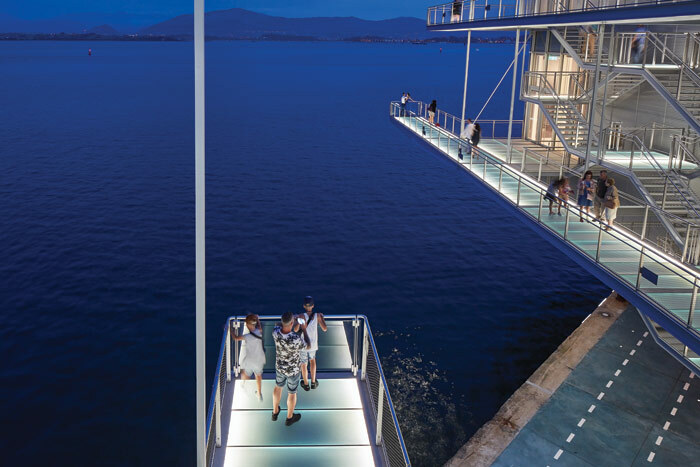 On the western side, the gangways cantilever particularly vertiginously out across the water. 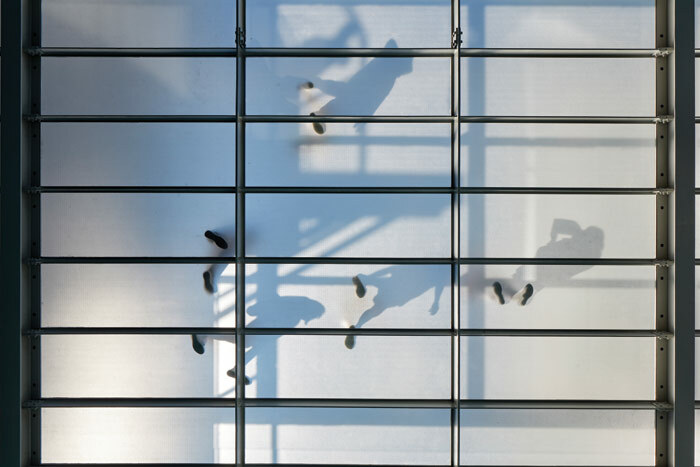 The vertical and lateral circulation of people outside of the building connects directly with the thrill of Piano’s spectacular debut. ‘We started a long time ago with the Centre Pompidou in Paris — people on the escalators, looking down on the plaza,’ declares Piano. ‘More recently, [at] the new Whitney [Museum in New York, opened in 2015] we have stairs on the side’ [and terraces too]. Following form, surface and circulation, there is a fourth element to the Centro Botín design, and that is the Jardines de Pereda. RPBW worked with landscape architect Fernando Caruncho to expand the park from 20,000 sq m to 48,000 sq m, with new greenery and blue concrete paths that reference the water. Triangular sculptural installations have been crafted by the artist Cristina Iglesias, in which she embeds her hallmark of water trickling over miniature landscapes of metal. Beneath all of this lies a new 200m stretch of tunnel, burying a road that had crossed the site. Even this is no ordinary underpass — a service entrance to the Centro Botín lies behind a gate beside one lane. 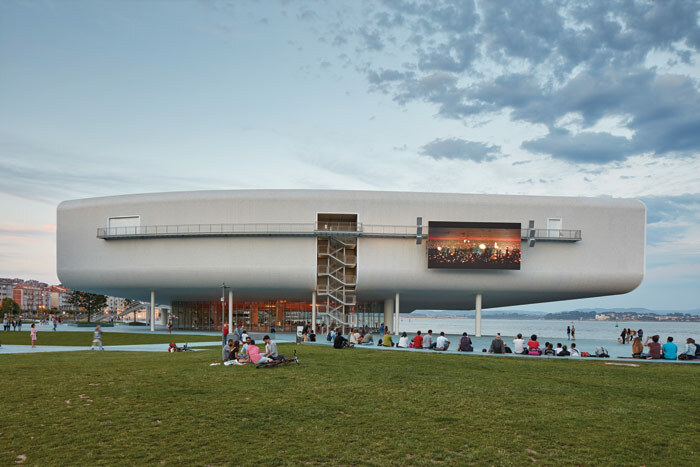 The Centro Botín is not the first arts centre with a waterside location in a rainy European coastal city that Piano has designed. The Astrup Fearnley in Oslo has similarities, such as the harvesting of grey light by a skylight over its main gallery, and the two volumes connected across a channel, in this case a canal inlet. Nor is it Piano’s first Spanish project — in 2006, he designed the Luna Rossa, Valencia (2006), the base for the Italian team in the America’s Cup sailing race. Its aluminium frame with panels made of Kevlar sails was erected in 40 days, but it is essentially an orthogonal box. Both these works sit firmly on the ground. Recently Renzo Piano had an asteroid named after him (it’s 216241). ‘They told me in Boston it will not come [near the earth] for another two million years,’ he noted dryly, but in the meantime it swings freely around the sun, yet caught by its gravity. 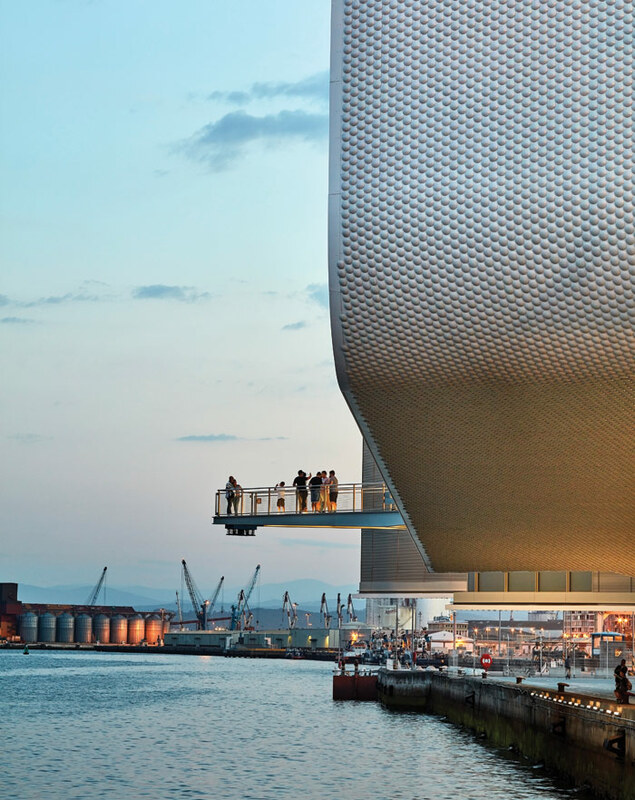 ‘As an architect you spend your life fighting gravity,’ Piano declared on the roof of the Centro Botín. In Santander, he seems to have won the fight, not only in floating his beautifully crafted volumes, but by keeping aloft an architectural excitement that is as alive as it was 40 years ago in Paris.